When I woke up on Friday morning around 5:15, I couldn't believe how fast time was flying during my BEA trip... especially when I considered the few hours I managed to sleep the prior night! Despite feeling a little tired, it was my last full day in New York and I wanted to get the most out of it. Plus, I wasn't too worried. I knew the adrenaline would get me through the next day and a half of fun activities. One of the highlights of 2013 BEA took place bright and early on Friday morning. Adriana Trigiani, one of my favorite authors and favorite people in the world, invited bloggers to her house for an Early Bird Breakfast! Kathy and I were pretty confident that we knew where we were going since we had made it to the general area the prior day with no issues. Famous last words... Let's just say Kathy and I weren't on our game. We ended up almost getting on the wrong subway (and by that I mean we were ready to step on when Kathy noticed it wasn't the right one! ), and had to head back up to the street and walk another block to find the correct one. The funny thing is that we both kept saying that it didn't look quite right but neither one of us were confident enough with our navigation skills to stop! We still managed to make it to Adriana's house with a few minutes to spare. Good thing we left very early for every event or we would have been panicking! Adriana's house was lovely and it was exactly what I imagined. Of course, Adriana was a gracious host and she entertained all of us with stories about the paintings and other knick knacks in her house. She even served us breakfast on her grandmother's china. I was a nervous wreck, but she assured us that she was a firm believer in using it rather than keeping it locked up! I was thrilled to meet some of Adriana's friends including Susan Fales Hill, author of ONE FLIGHT UP and IMPERFECT BLISS, and John Searles, the Today Show book correspondent, editor of Cosmo and author of the new novel HELP FOR THE HAUNTED. Susan and Adriana met earlier in their careers when they were both writing for television shows, and John is Adriana's neighbor. They were both very easy to talk to and they immediately put me at ease. John even offered to give us a tour of the Cosmo offices (but I'm not sure he was totally serious!) I had such a great time that I almost forget that I was standing there chatting with famous people! Kathy and I knew that Adriana needed to head over to BEA and we did too for the Book Group Speed Dating Session. As we were leaving, we were handed a little "Adriana swag" -- a travel coffee mug with Adriana's new book title printed on it. I was thrilled to have such a special keepsake of an amazing event! We decided to take a cab to Javits -- no more buses for these girls, and we arrived just in time for the start of this very fun event. I attended the Book Group Speed Dating Session presented by ReadingGroupGuides.com last year and it was a blast. Basically, you sit at a table with about eight other people and publishers travel to each table and share their top book club picks for the fall with the group. I am always drawn to book club books and seem to add about 20+ books to my wish list. Fortunately, the publishers also bring a few copies to share! 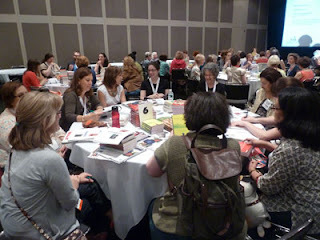 2013 BEA Book Club Speed Dating Session -- I'm in the white shirt! Because of time limitations, I was only able to have a few of the publishers pitch their books. You can see all of the recommendations here. Here's a few of the ones I discovered at this event that I'm really excited to read! After this session, Kathy and I headed back up to the showroom floor and picked up a few more ARCs. We only had a little time before our lunch with Chelsy from Big Honcho Media and Candace/Beth Fish Reads. We all agreed that we wanted to get away from the hustle and bustle of the convention center and we decided to try Clyde Frazier's Wine and Dine. 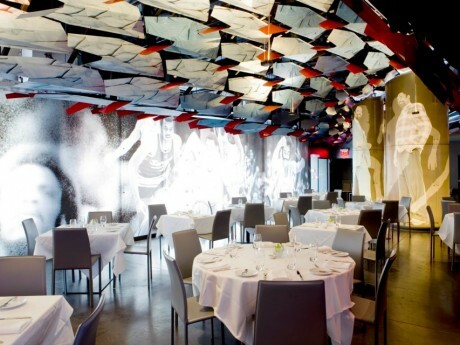 Clyde Frazier is a former basketball player and the restaurant was decorated with huge murals of Clyde along with lots of televisions tuned to sports stations. Since it was incredibly hot, we were grateful for the air conditioning; however, we ordered a variety of sandwiches and salads and they were all very good. Despite the heat and humidity (although Kathy didn't think it was humid! 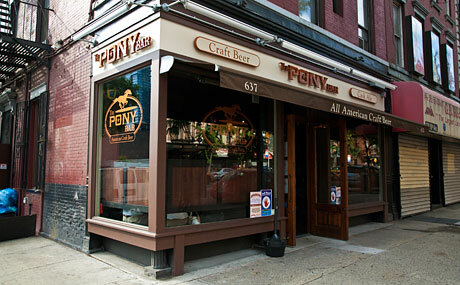 ), Kathy wanted to visit The Pony Bar and get a beer badge for Untappd. We trudged through Hell's Kitchen and I was personally glad it was in the middle of the day. When we got there, we were surprised to find that the bar was closed, but a worker took pity on the three middle-aged women standing at the door. After Kathy explained why she was there, he opened the bar just for us and let us come inside. What a guy! We headed back to the Javits Center, and Kathy and I set out to meet Marcia Clark and George Pelecanos. Unfortunately, the line was crazy long and we weren't willing to wait even though I desperately wanted Marcia Clark's new book! We ended up going to Algonquin's booth instead for the celebration of their new Children's imprint and managed to get an adorable bag along with quite a few of their new releases. After the "party," Kathy and I decided to swing back to the Mystery Writer's of America booth and sure enough the line was almost nonexistent! We managed to snag autographed copies of the books, and they were both extremely nice! By mid afternoon, Kathy and I had definitely had enough of the showroom floor and that was a good thing since we had cocktails planned with Dorothea Benton Frank at the Tipsy Parson. We both participated in the Hit the Beach with Dorothea Benton Frank Read Along and that gave us the opportunity to spend some quality time with Ms. Frank. After walking in the heat (it was really hot!) 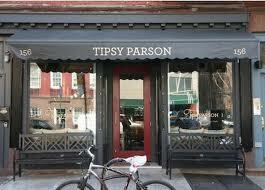 with some fellow blogger friends and the fine folks at Harper Collins, we arrived at this adorable bar. We had a private room in the back which ended up being a good thing since we were quite loud, but I loved seeing the book wallpaper in the front of the bar. We were served lots of Southern goodies like boiled peanuts, cheese straws, and fried green tomatoes; and I can definitely say that we all had a blast. Ms. Frank was so much fun and had us laughing like crazy! We left The Tipsy Parson and rushed to another party at Farrar Strauss & Giroux for their Book Keeping reception. There we met some of their authors and employees, and once again, I was excited to discover some new-to-me books. I'm not sure if it was on purpose or not, but Kathy wore the perfect outfit to this party -- her pants had little bees embroidered on them and matched the Book Keeping graphic! 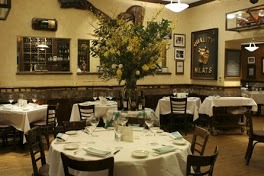 Finally, Kathy, Candace, Alison and I ended the evening with a nice dinner at Smith & Wollensky. The portions were insane and I don't know if any of us even ate half of what was served despite finding that the food was amazing. I ordered fish because I wasn't that hungry and knew I couldn't eat a steak, but everyone else ordered red meat. I was a little envious, but poor Alison received her steak and it was still moo-ing! Kathy and I arrived back at our hotel and I needed to pack since I was leaving around lunchtime on Saturday. Of course, we couldn't fall asleep but that's nothing new for us. I walked back to the hotel and was absolutely soaking wet because it was still so hot! I decided to take a taxi to Penn Station rather than walking over a mile through a very crowded Times Square. Smart choice! My train trip home was uneventful and I got lots of reading done. While I was bittersweet about leaving New York, I couldn't wait to see my husband and kids! New York and BEA is always so fabulous. You got to do all the fun BEA things plus had a few extras with people you and Kathy love -- how lucky are you? I really loved spending time with you and Kathy. George Pelecanos is such an amazing local author. Seems like BEA this year was more about the parties and events off the showroom floor. I love all the book stuff, but I'm just as excited about the dinners and drinks! It sounds like you and Kathy had a ball.